With the construction of UHV (Ultra-High Voltage) transmission lines and radar stations, the interference of UHV transmission lines to air intelligence radar stations has become increasingly prominent. Aiming at the problem that it is difficult to solve the loss of radar detection range caused by UHV transmission lines, the idea of using RCS (Radar Cross Section) of UHV transmission towers as an intermediate parameter to solve the radar detection range loss is proposed. In order to solve the problem of accuracy when using Physical Optics (PO) to solve such electromagnetic scattering problems of complex structures, the traditional PO method needs to be improved when used in the calculation of the large-size’s scattering field like the UHV tower. It is proposed to use Incremental Length Diffraction Coefficient (ILDC) to revise the diffraction of the edge of the tower, and to study the coupling conditions with the PO method, so as to solve the scattering field of the complex structure of the tower. Based on this, 5 UHV transmission towers’ model is established to simulate the UHV transmission lines, and the regular variation of radar detection loss with the distance between the two systems is studied. 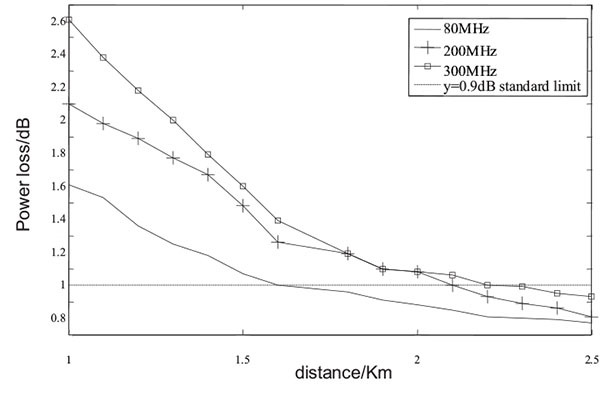 These results show that when the distance between the UHV transmission lines and the radar station is more than 2200 m, the loss can reach within 0.9 dB of the standard, which is in line with the standard for the construction around the air intelligence radar station. The issue of electromagnetic interference between UHV transmission lines and radar stations has become increasingly serious, the specification of guard spacing requires a study of radar detection losses. In this study, RCS was used as an intermediate parameter to solve the radar detection loss, the PO-ILDC method was used to improve the accuracy of solving electromagnetic field. The RCS-based detection power loss method proposed in this paper saves the resources and the economic cost to a certain extent. The PO-ILDC method is more accurate to solve the complex structure’s electromagnetic field. When the UHV construction is adjacent to the radar station, according to the maximum frequency of the interference loss, it should be away from the radar station at least 2,200 meters. Keywords: UHV power transmission lines, Air defense surveillance radar station, Electromagnetic interference, RCS, The detector distance, PO-ILDC. © 2018 Zhang et al. With the increasing constructions of UHV transmission lines and radar stations [1L. Zhenya, Theory of UHVDC., China Economic Press: Beijing, . M, 2L. Zhenya, Z. Qiping, D. Cun, Z. Lin, and W. Zhidong, "Efficient and Security Transmission of Wind, Photovoltaic and Thermal Power of Large-scale Energy Resource Bases Through UHVDC Projects", Zhongguo Dianji Gongcheng Xuebao, vol. 34, no. 16, pp. 2513-2522. ], the issue of electromagnetic interference between these two industrial-grade systems has become increasingly serious [3W. Xiong, and W. Baoquan, Electromagnetic Environmental of Power Transmission, China Electronic Power Press: Beijing, pp. 83-94. M]. However, the standard Requirement of electromagnetic environment protection for air defense surveillance radar station applied in the current projects only stipulate the protecting distance between transmission lines and radar stations of 500 kV and below voltage levels. However, as the backbone of the power grid, the current UHV Lines are lack of standards for the corresponding constructions. Although there are no new standards for UHV transmission lines and radar stations, the current standard proposed the working guidelines for the Air Defense Surveillance Radar Station [4GB13618-92. Requirement of electromagnetic environment protection for air defense surveillance radar station, China Standards Press: Beijing, . S]. There are three requirements in this standard, which respectively stipulate the maximum permissible interference voltage of the environment around the radar station, the maximum permissible detection range loss and the permissible duration of interference. For the maximum permissible interference voltage, the minimum value can be easily calculated by the given formula. For the maximum permissible detection range loss, only the minimum value is given in this regulation, but there is no specific method to solve it. For the permissible duration, it belongs to non-controlled factors. Therefore, the first step of the key point of this research on the protection of the UHV power transmission lines against the radar station is to solve the detection range loss. At present, there are few studies on the interference between the UHV transmission lines and Air Defense radar stations either in China or abroad. Some researchers studied the decay effect of UHV transmission lines to the radar electromagnetic waves by a scale model experiment [5C. 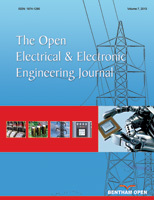 Jingping, L. Jianping, and T. Junsheng, "Test study on the Attenuation Effects of Electromagnetic Wave Caused by UHV Overhead Transmission Lines and towers", Modern Electronics Technique, vol. 15, pp. 146-148.]. The band of the experimental frequency is single, which is different from the actual environment and cannot truly reflect the actual situation of interference loss. However, there are many existing research results of the theoretical analysis and numerical solutions in electromagnetic interference [6S. Toyada, and H. Hashimoto, "Scattering characteristics of VHF television broadcasting waves by steel towers of overhead power transmission lines", IEEE Trans. Electromagn. Compat., vol. 21, no. 1, pp. 62-65. [http://dx.doi.org/10.1109/TEMC.1979.303799] , 7Z. Xiaowu, T. Jian, and Z. Huanguo, "Reradiation interference computation model of high voltage transmission line to the shortwave radio direction finding station", 20th International Zurich Symposium on Electromagnetic Compatibility, Zurich, Switzerland, IEEE Electromagnetic Compatibility, pp. 309-312. [http://dx.doi.org/10.1109/EMCZUR.2009.4783452] ], For example, PO method is provided as a high-frequency approximation algorithm to solve the electromagnetic scattering field of large electromagnetic objects, which is widely used by researchers due to its fast calculation’s speed and less resource consumption [8F. Quanjie, The Application of the Physical Optics Method in EM Scattering from Conductor and Coating Target, Xidian University, .]. However, PO method neglects the contribution of the edge’s diffraction field of the target during the calculation so that it results in a poor accuracy when solving such electromagnetic scattering problems of complex objects like the UHV tower [9Z. Yanju, J. Yuesong, Z. Chonghui, and X. Canwei, "Fast computation of electromagnetic scattering characteristics from conducting targets using modified-physical optics and graphical electromagnetic computing", Wuli Xuebao, vol. 16, pp. 182-188.]. Therefore, the method for calculating the scattering field of the UHV tower needs to be improved. In order to obtain the loss of detection range, this paper proposed an idea that uses RCS as the intermediate quantity to build the relatedness between the interference from UHV transmission lines and the radar’s detection loss. Therefore, in order to deal with RCS, based on PO method, the conditions of the coupling method PO-ILDC for solving the scattering field of the UHV tower are analyzed from the characteristic of the radar’s electromagnetic wave and the tower’s model. As a result, we use this method to deal with the radar detection loss and provide suggestions for the future UHV construction projects. UHV transmission lines can be embodied as a kind of electromagnetic strong scattering of great size object under the excitation of electromagnetic wave [10T. Bo, Main issues in the EMI Protection on Wireless Electronic Facilities from Adjacent UHVDC Power Lines, Huazhong University of Science & Technology, .]. As shown in Fig. (1 ), when the transmission lines approach the radar station, the lines and towers will scatter the incident wave of the radar, resulting in the change of amplitude and phase of the original radar electromagnetic wave, which causes interference. Due to the perpendicularity of the tower to the ground and the lines parallel to the ground under the vertical polarization of the incident wave, recent researches have shown [11Z. Zhibin, G. Zheyuan, and Z. Xiaowu, "Passive Interference to Radio Station Caused by UHV AC Transmission Line in Shortwave Frequency", High Voltage Engineering, vol. 35, no. 8, pp. 1818-1823.] that the main source of interference is the tower. Therefore, the interference caused by the lines is usually neglected. Based on this, the UHV tower is regarded as the main object for research. The interference of transmission tower to radar. 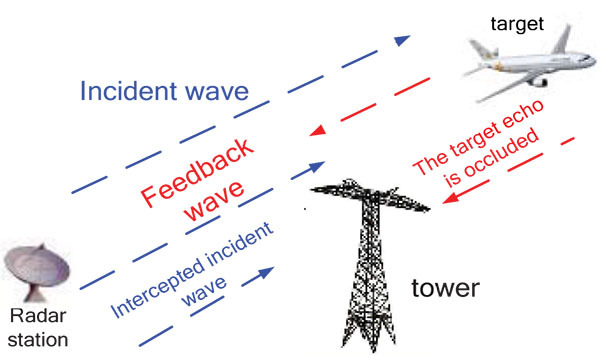 The National standard Requirement of electromagnetic environment protection for air defense surveillance radar station clearly puts forward three principles for the radar working: (1) If active interference is inevitable, the detection range loss cannot exceed 5%;(2) The impact of an obstacle to the radar detection range loss cannot exceed 5%; (3) The continuous interference time cannot exceed 10 seconds. is the maximum permissible interference voltage RMS (Root Mean Square) of the input of the radar receiver; C is the maximum permissible interference voltage increment factor relative to white noise, which is taken 3 here; Unf is RMS of the system noise’s voltage, which is equivalent to the receiver’s input and taken 0.77 here. The permissible voltage can be calculated from (1) for 1.1(µV). For the permissible interference duration, it belongs to the uncontrollable factors that appear in an engineering practice, which is not the main point of our discussion. For the permissible detection range loss, it is the focus of this paper. Assuming that the radar transmits constant power, the loss of 5% of the detection range can be equivalent to the reduction of 0.9dB to the radar detection power [12L. Yangtao, and H. Zhimei, "Research on jamming simulation to angle tracking system of nmnopulse radar", Aerospace Electronic Warfare, vol. 4, pp. 62-64.]. σ is the RCS of the target, L is the system propagation loss. After combining (2) and (3), we can know that the main variable that affects the power loss of radar detection is σ, all the other parameters depend on the radar's own properties. Therefore, σ will be used as an important intermediate parameter in solving the power loss of the transmission tower to the radar detection . The solution of RCS becomes the key point to solve the radar detection loss. Es is the scattering field of the transmission tower, Ei is the electric field incident wave. In order to solve the scattering field of the transmission tower, a mathematical model of the tower is established as shown in Fig. (2 ). There are two coordinate systems in Fig. (2 ): the Cartesian (x,y,z) and the spherical coordinates (r,θ,φ). The induced current density at any point r' on the surface of the angle steel of the tower is J(r'). At any position of the field point r, the intensity of the scattering from the tower is E's. The mathematical model of steel pylons’ RCS. S is the integral field of the tower surface; n is the normal direction of the tower surface; E and H are the electric field and magnetic field vector of the tower surface respectively; r is the position vector of the field point, ŝ is the unit vector of the scattering direction, k is the wave number, Z0 is the space wave impedance. (1)The curvature radius of the tower surface is much longer than the electromagnetic wave length. 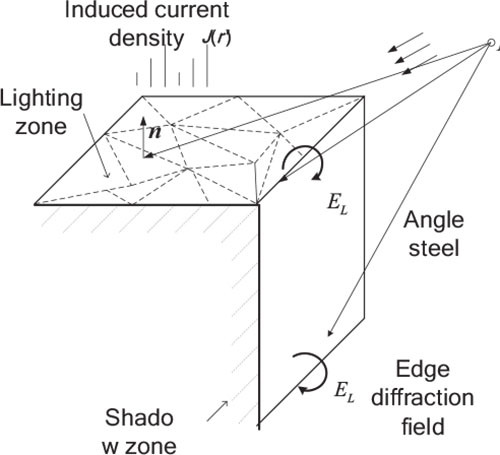 (2) The induced current exists on the ‘lighting zone’, but the current on the ‘shadow zone’ is approximately zero. (3) The induced current characteristic on the surface of the ‘lighting zone’ is the same as the induced current characteristic on the infinite surface tangent to the incident point surface. Due to the “∟” type structure of the tower angle, the incident wave will form a large dark area at the notch of the angle steel. As shown in Fig. (3 ), the angle steel is divided into the lighting zone, the shadow zone and the transition zone of the edge of the angle steel. PO method integrates the induced current in the lighting zone of the angle steel, but ignores the contribution of the diffraction field around the edge of the angle steel so that the induced current in ‘shadow zone’ is approximately zero. Based on this, ILDC method is introduced in this paper to correct the diffraction field of the angle steel and improve the precision. The scattered field of the angle steel. Based on the equation of Maxwell and 3 hypothetical conditions of PO method, the surface of the angle steel which is regarded as a conductor should meet the following equations [16T. Deyuan, Study on the Hybrid Method of MoM-PO and Its Application, Xidian University, . ]: . . Hi is the magnetic field of the incident wave. In addition, according to the different styles of expressions of PO method, can be replaced by J shown in Equation (6). PO method essentially represents the scattering field of the tower as a function integration of the induced current on the surface of the tower, so the induced current is the only unknown quantity of this equation. Therefore, the scattering field can be obtained by calculating the integration of the induced current on the surface of the angle steel. In order to solve the integration of induced current, it is necessary to split angle steel surface as Fig. (4 ). A pair of triangle surface element on the angle steel. is RWG (Rao-Wilton Glisson) basis function [18J. Taboada, F. Obelleiro, J. Rodriguez, I. Garcia-Tunon, and L. Landesa, "Incorporation of Linear-Phase Progression in RWG Basis Functions", Microw. Opt. Technol. Lett., vol. 44, no. 2, pp. 106-112. 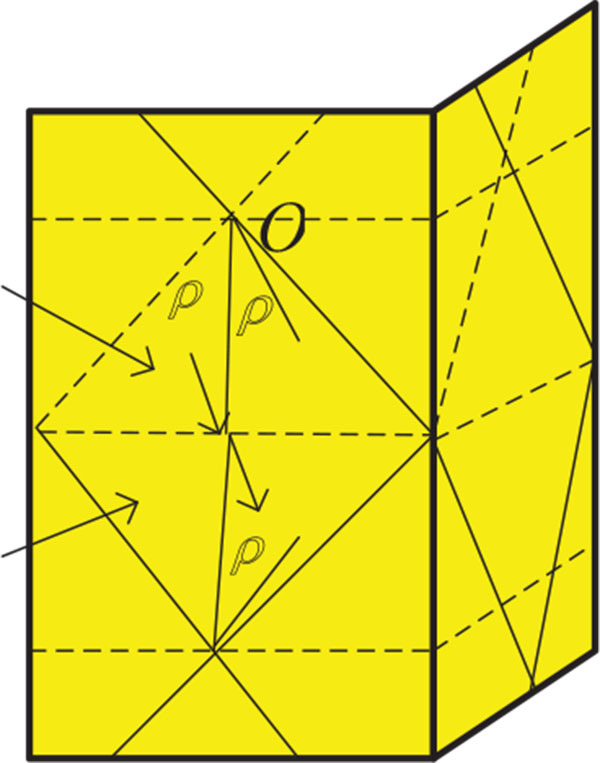 [http://dx.doi.org/10.1002/mop.20560] ]; N is the total number of edges of the triangular facets on the common side; γn is the scalar coefficient to be solved. Finally, combining Eq. (5)~(9) can give the scattering field E's. 4.2. The Application of ILDC Method to Solve the Edge Diffraction Field of Angle Steel. dt represents the tower’s edge element; EL is the tower edge’s diffraction field; and are the unit vectors of incidence and scattering directions; ê is the unit vector along the polarization direction of the incident electric field, and R' is the distance from the edge to the field point. Therefore, the diffraction field of the tower can be regarded as the sum of the integration of each edge of the tower. The angles of the incident wave and angle steel. The step function of Equation (12) is based on the splitting surface of a given angle steel. When the incident wave of the radar irradiates a splitting surface, the physical optics should be added and the other splitting surface should be removed. 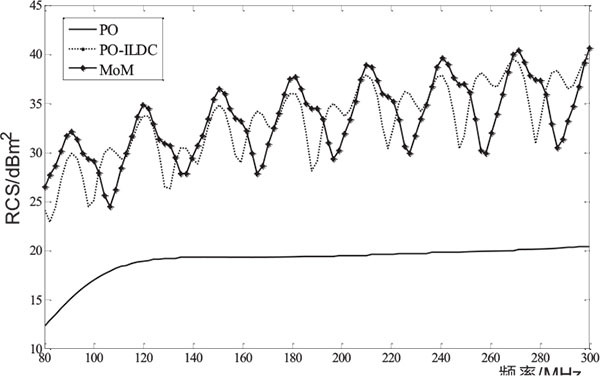 At the same time, at the edge of the target, ILDC method also adds a correction of the diffraction coefficient to improve the accuracy [20I. Michael, "Equivalent Currents for Arbitray Aspects of observation", IEEE Trans. Antenn. Propag., vol. 23, pp. 252-258. [http://dx.doi.org/10.1109/TAP.1984.1143303] ]. MoM (Moment) method is used as a benchmark to verify the accuracy of the PO-ILDC method with a simple model of the UHV tower’s angle steel.MoM is a numerical method of discrete integral equations, which has high computational accuracy. However, it takes too much resource to calculate the high-frequency’s scattering field of complex targets. Therefore, only a simple model is established for verification. According to the UHV engineering practices, the specification L200 of the angle steel is used to establish the angle steel model and the 1-tower model as shown in Figs. (6a and 6b ). The angle steel’s width of the model is 0.2 m. The radar excitation source is implanted with a vertical polarized plane wave. The electric field intensity is 1V / m. The incident frequency is changed from 80 MHz to 300 MHz. 101 frequency points are set here and the PO-ILDC method is compared with PO method and MoM method. Fig. (7 ) is based on MoM method which is regarded as a benchmark in the comparison of three algorithms. As can be seen from the Fig. (7 ), when PO method is used to calculate the RCS of the angle steel, the induced current is neglected in the shadow zone of the angle steel by PO method, and the calculation result greatly deviated from MoM method, which resulted in a low result. In contrast, the results of using PO-ILDC method and MoM method basically match with each other. The simulation model of the angel steel and tower. The comparison of PO , PO-ILDC and MoM for steel. In order to ensure the accuracy of the algorithm used in the calculation of a complex target, as shown in Figs. (5b , 1 )- tower model which is similar to the actual UHV tower is established. The model has a total height of 65 m and a cross-arm width of 35 m.
As can be seen from Fig. (8 ), the RCS result of using the PO method is obviously lower than that of MoM method and PO-ILDC method. Compared with PO method, the result of PO-ILDC method indicates that the relative error is smaller. Result by PO and PO-ILDC for the tower. In the UHV transmission lines’ interference studies, 5-based towers are often used as research objects [21T. Bo, Z. Jiangong, Z. Zhibin, L. Hongzhi, and W. Fangqiang, "Approximate Calculation of Reradation Interference in High Frequency Signals from UHV transmission lines", High Voltage Engineering, vol. 38, no. 6, pp. 1420-1427.]. In addition, MoM method is no longer applicable. 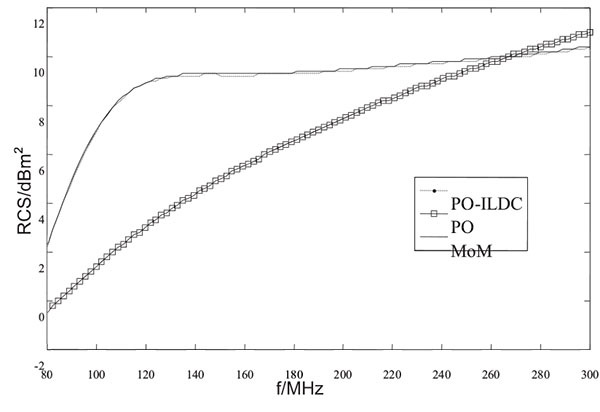 The combined algorithm of PO-ILDC is used to solve the variation of the power loss of the 5-based tower with the guard spacing at 80 MHz, 200 MHz and 300 MHz respectively, as shown in Fig. (9 ). The radar detector power loss. It can be seen from Fig. (9 ) that the power loss caused by the tower under the three different excitation frequencies is within 2.6 dB; the amplitude of the loss increases with these frequencies rising up; at the same time, as the distance changes, the loss under different frequencies all drops within 0.9 dB after 2.2 km. The dashed line in Fig. (9 ) shows the limit of 0.9 dB in the standard. As shown in the figure, when the radar’s incident frequency is 80 MHz, the maximum loss is about 1.5 dB. As the distance is increased to 1.6 km, the loss is reduced to the prescribed limit. When the incident frequency is 200 MHz, the maximum loss is about 2 dB, and when the pitch reached 2.1 km, the loss drops to 0.9 dB; Finally, when the frequency is increased to 300 MHz, the guard spacing needs to reach 2.3 km before it meets the standards. This paper proposed an idea to use RCS of the UHV tower as the intermediate quantity to obtain the loss of radar detection range. 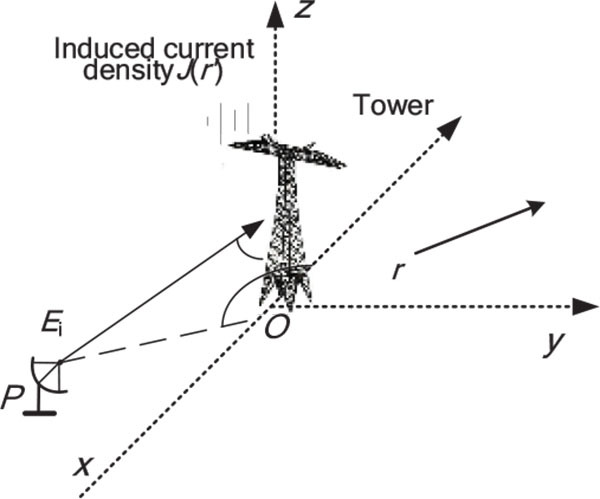 Therefore, in order to solve RCS of the complex structure of the UHV tower, based on the PO method, the conditions of the coupling method PO-ILDC for solving the scattering field of the UHV tower are analyzed from the characteristic of the radar’s electromagnetic wave and the tower’s model. As a result, we use this method to deal with the radar detection loss and provide a suggestion in the future UHV construction projects. According to the recent standard and results, the interference voltage should not exceed 1.1 µV in the vicinity of the radar station. When the interference occurs, the duration of continuous interference should be controlled within 10 s. When the UHV construction is adjacent to the radar station, according to the maximum frequency of the interference loss, it should be away from the radar station at least 2,200 meters. This work is supported in part by State Key Laboratory of Power Grid Environmental Protection(GYW51201700590) and Science and Technology Program of SGCC(GY71-16-011). L. Zhenya, Z. Qiping, D. Cun, Z. Lin, and W. Zhidong, "Efficient and Security Transmission of Wind, Photovoltaic and Thermal Power of Large-scale Energy Resource Bases Through UHVDC Projects", Zhongguo Dianji Gongcheng Xuebao, vol. 34, no. 16, pp. 2513-2522. C. Jingping, L. Jianping, and T. Junsheng, "Test study on the Attenuation Effects of Electromagnetic Wave Caused by UHV Overhead Transmission Lines and towers", Modern Electronics Technique, vol. 15, pp. 146-148. F. Quanjie, The Application of the Physical Optics Method in EM Scattering from Conductor and Coating Target, Xidian University, . Z. Yanju, J. Yuesong, Z. Chonghui, and X. Canwei, "Fast computation of electromagnetic scattering characteristics from conducting targets using modified-physical optics and graphical electromagnetic computing", Wuli Xuebao, vol. 16, pp. 182-188. T. Bo, Main issues in the EMI Protection on Wireless Electronic Facilities from Adjacent UHVDC Power Lines, Huazhong University of Science & Technology, . Z. Zhibin, G. Zheyuan, and Z. Xiaowu, "Passive Interference to Radio Station Caused by UHV AC Transmission Line in Shortwave Frequency", High Voltage Engineering, vol. 35, no. 8, pp. 1818-1823. L. Yangtao, and H. Zhimei, "Research on jamming simulation to angle tracking system of nmnopulse radar", Aerospace Electronic Warfare, vol. 4, pp. 62-64. D. Lufei, G. Fulu, and C. Jianchun, Principles of Radar., Electronic Industry Press: Beijing, . V. Chen, and H. Ling, Time-Frequency Transforms for Radar Imaging and Signal Analysis, Artech House: Boston, . C. Yiqiao, Research on the Method of Analysis for Large Size Targets, UESTC, . T. Deyuan, Study on the Hybrid Method of MoM-PO and Its Application, Xidian University, . K.M. Mitzner, Incremental Length Diffraction Coefficients, Technical Report No. AFAL-TR-73-296. Northrop Corporation, Aircaft Division, April 1974. T. Bo, Z. Jiangong, Z. Zhibin, L. Hongzhi, and W. Fangqiang, "Approximate Calculation of Reradation Interference in High Frequency Signals from UHV transmission lines", High Voltage Engineering, vol. 38, no. 6, pp. 1420-1427.